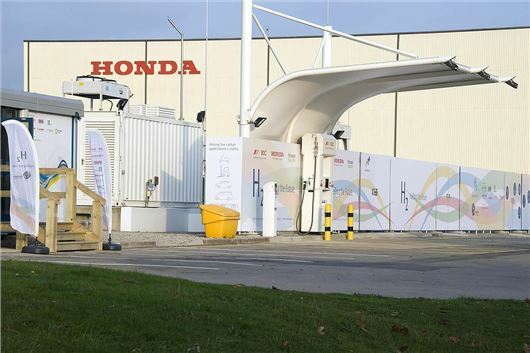 The Swindon Honda plant is now producing renewable hydrogen entirely from solar power. The plant previously had a hydrogen filling station, but the fuel was shipped in by trucks – now the plant can produce completely carbon-neutral fuel. The fuel is being used to power an on-site learning centre, along with some of the plant’s forklift trucks, plus a fleet of seven converted Ford Transit vans, operated by Swindon Council and Commercial Group. The fuel is also available to the public should owners of hydrogen-powered vehicles need a fill-up. The solar-powered hydrogen production facility has been developed in collaboration with BOC, Fuel Cell Systems, Briggs Equipment and received funding from the UK’s innovation industry. It’s currently capable of producing 20 tons of hydrogen a year, while demand is expected to be around 10 tons initially - meaning the facility is prepared for extra demannd in future. One of the reasons Honda never brought its FCX Clarity hydrogen fuel cell car to the UK was lack of infrastructure to keep it running, so the new fuelling station provides a good case for the next generation Honda fuel cell vehicle, due in 2016.